MPEG-4 Part 3 or MPEG-4 Audio (formally ISO/IEC 14496-3) is the third part of the ISO/IEC MPEG-4 international standard developed by Moving Picture Experts Group. It specifies audio coding methods. The first version of ISO/IEC 14496-3 was published in 1999. The MPEG-4 Part 3 consists of a variety of audio coding technologies – from lossy speech coding (HVXC, CELP), general audio coding (AAC, TwinVQ, BSAC), lossless audio compression (MPEG-4 SLS, Audio Lossless Coding, MPEG-4 DST), a Text-To-Speech Interface (TTSI), Structured Audio (using SAOL, SASL, MIDI) and many additional audio synthesis and coding techniques. MPEG-4 Audio does not target a single application such as real-time telephony or high-quality audio compression. It applies to every application which requires the use of advanced sound compression, synthesis, manipulation, or playback. MPEG-4 Audio is a new type of audio standard that integrates numerous different types of audio coding: natural sound and synthetic sound, low bitrate delivery and high-quality delivery, speech and music, complex soundtracks and simple ones, traditional content and interactive content. First edition 1999 2001 ISO/IEC 14496-3:1999 also known as "MPEG-4 Audio Version 1"
MPEG-4 Audio includes a system for handling a diverse group of audio formats in a uniform manner. Each format is assigned a unique Audio Object Type to represent it. Object Type is used to distinguish between different coding methods. It directly determines the MPEG-4 tool subset required to decode a specific object. The MPEG-4 profiles are based on the object types and each profile supports different list of object types. 2 AAC LC (Low Complexity) 1999 Used in the "AAC Profile". MPEG-4 AAC LC Audio Object Type is based on the MPEG-2 Part 7 Low Complexity profile (LC) combined with Perceptual Noise Substitution (PNS) (defined in MPEG-4 Part 3 Subpart 4). 3 AAC SSR (Scalable Sample Rate) 1999 MPEG-4 AAC SSR Audio Object Type is based on the MPEG-2 Part 7 Scalable Sampling Rate profile (SSR) combined with Perceptual Noise Substitution (PNS) (defined in MPEG-4 Part 3 Subpart 4). 29 PS (Parametric Stereo) 2004 and 2006 used with AAC LC and SBR in the "HE-AAC v2 Profile". PS coding tool was defined in 2004 and Object Type defined in 2006. 34 MPEG-1/2 Layer-3 2005 also known as "MP3onMP4"
44 LD MPEG Surround 2010 This object type conveys Low Delay MPEG Surround Coding side information (that was defined in MPEG-D Part 2 – ISO/IEC 23003-2) in the MPEG-4 Audio framework. 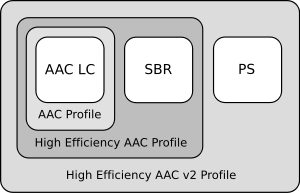 Hierarchical structure of AAC Profile, HE-AAC Profile and HE-AAC v2 Profile, and compatibility between them. The HE-AAC Profile decoder is fully capable of decoding any AAC Profile stream. Similarly the HE-AAC v2 decoder can handle all HE-AAC Profile streams as well as all AAC Profile streams. Based on the MPEG-4 Part 3 technical specification. The MPEG-4 Audio standard defines several profiles. These profiles are based on the object types and each profile supports different list of object types. Each profile may also have several levels, which limit some parameters of the tools present in a profile. These parameters usually are the sampling rate and the number of audio channels decoded at the same time. There is no standard for transport of elementary streams over a channel, because the broad range of MPEG-4 applications have delivery requirements that are too wide to easily characterize with a single solution. The capabilities of a transport layer and the communication between transport, multiplex, and demultiplex functions are described in the Delivery Multimedia Integration Framework (DMIF) in ISO/IEC 14496-6. A wide variety of delivery mechanisms exist below this interface, e.g., MPEG transport stream, Real-time Transport Protocol (RTP), etc. Transport in Real-time Transport Protocol is defined in RFC 3016 (RTP Payload Format for MPEG-4 Audio/Visual Streams), RFC 3640 (RTP Payload Format for Transport of MPEG-4 Elementary Streams), RFC 4281 (The Codecs Parameter for "Bucket" Media Types) and RFC 4337 (MIME Type Registration for MPEG-4). LATM and LOAS were defined for natural audio applications, which do not require sophisticated object-based coding or other functions provided by MPEG-4 Systems. The Advanced Audio Coding in MPEG-4 Part 3 (MPEG-4 Audio) Subpart 4 was enhanced relative to the previous standard MPEG-2 Part 7 (Advanced Audio Coding), in order to provide better sound quality for a given encoding bitrate. It is assumed that any Part 3 and Part 7 differences will be ironed out by the ISO standards body in the near future to avoid the possibility of future bitstream incompatibilities. At present there are no known player or codec incompatibilities due to the newness of the standard. The MPEG-2 Part 7 standard (Advanced Audio Coding) was first published in 1997 and offers three default profiles: Low Complexity profile (LC), Main profile and Scalable Sampling Rate profile (SSR). The MPEG-4 Part 3 Subpart 4 (General Audio Coding) combined the profiles from MPEG-2 Part 7 with Perceptual Noise Substitution (PNS) and defined them as Audio Object Types (AAC LC, AAC Main, AAC SSR). High-Efficiency Advanced Audio Coding is an extension of AAC LC using spectral band replication (SBR), and Parametric Stereo (PS). It is designed to increase coding efficiency at low bitrates by using partial parametric representation of audio. AAC Scalable Sample Rate was introduced by Sony to the MPEG-2 Part 7 and MPEG-4 Part 3 standards. It was first published in ISO/IEC 13818-7, Part 7: Advanced Audio Coding (AAC) in 1997. The audio signal is first split into 4 bands using a 4 band polyphase quadrature filter bank. Then these 4 bands are further split using MDCTs with a size k of 32 or 256 samples. This is similar to normal AAC LC which uses MDCTs with a size k of 128 or 1024 directly on the audio signal. The advantage of this technique is that short block switching can be done separately for every PQF band. So high frequencies can be encoded using a short block to enhance temporal resolution, low frequencies can be still encoded with high spectral resolution. However, due to aliasing between the 4 PQF bands coding efficiencies around (1,2,3) * fs/8 is worse than normal MPEG-4 AAC LC. MPEG-4 AAC-SSR is very similar to ATRAC and ATRAC-3. The idea behind AAC-SSR was not only the advantage listed above, but also the possibility of reducing the data rate by removing 1, 2 or 3 of the upper PQF bands. A very simple bitstream splitter can remove these bands and thus reduce the bitrate and sample rate. Note: although possible, the resulting quality is much worse than typical for this bitrate. So for normal 64 kbit/s AAC LC a bandwidth of 14–16 kHz is achieved by using intensity stereo and reduced NMRs. This degrades audible quality less than transmitting 6 kHz bandwidth with perfect quality. Bit Sliced Arithmetic Coding is an MPEG-4 standard (ISO/IEC 14496-3 subpart 4) for scalable audio coding. BSAC uses an alternative noiseless coding to AAC, with the rest of the processing being identical to AAC. This support for scalability allows for nearly transparent sound quality at 64 kbit/s and graceful degradation at lower bit rates. BSAC coding is best performed in the range of 40 kbit/s to 64 kbit/s, though it operates in the range of 16 kbit/s to 64 kbit/s. The AAC-BSAC codec is used in Digital Multimedia Broadcasting (DMB) applications. In 2002, the MPEG-4 Audio Licensing Committee selected the Via Licensing Corporation as the Licensing Administrator for the MPEG-4 Audio patent pool. ^ a b ISO (2009). "ISO/IEC 14496-3:2009 - Information technology -- Coding of audio-visual objects -- Part 3: Audio". ISO. Retrieved 2009-10-06. ^ a b ISO (1999). "ISO/IEC 14496-3:1999 - Information technology -- Coding of audio-visual objects -- Part 3: Audio". ISO. Retrieved 2009-10-06. ^ a b Business Wire (2002-12-02). "MPEG-4 Audio Licensing Committee Selects Via Licensing Corporation as Administrator; MPEG-4 Audio Licensing Committee Finalizing Terms for Audio Profile Licensing". The Free Library. Retrieved 2009-10-06. ^ a b c d Karlheinz Brandenburg; Oliver Kunz; Akihiko Sugiyama (1999). "MPEG-4 Natural Audio Coding – Audio profiles and levels". chiariglione.org. Archived from the original on 2010-07-17. Retrieved 2009-10-06. ^ Karlheinz Brandenburg; Oliver Kunz; Akihiko Sugiyama. "MPEG-4 Natural Audio Coding – scalability in MPEG-4 natural audio". chiariglione.org. Archived from the original on 2010-02-28. Retrieved 2009-10-06. ^ Rob Koenen, ISO/IEC JTC1/SC29/WG11 (March 2002). "Overview of the MPEG-4 Standard". chiariglione.org. Retrieved 2009-10-06. ^ a b MPEG. "MPEG standards – Full list of standards developed or under development". chiariglione.org. Archived from the original on April 20, 2010. Retrieved 2009-10-31. ^ ISO (2001). "ISO/IEC 14496-3:2001 - Information technology -- Coding of audio-visual objects -- Part 3: Audio". ISO. Retrieved 2009-10-14. ^ ISO (2005). "ISO/IEC 14496-3:2005 - Information technology -- Coding of audio-visual objects -- Part 3: Audio". ISO. Retrieved 2009-10-14. ^ a b MultimediaWiki (2009). "MPEG-4 Audio". MultimediaWiki. Retrieved 2009-10-09. ^ a b Karlheinz Brandenburg; Oliver Kunz; Akihiko Sugiyama (1999). "MPEG-4 Natural Audio Coding – General Audio Coding (AAC based)". chiariglione.org. Archived from the original on 2010-02-19. Retrieved 2009-10-06. ^ ISO (2003). "Bandwidth extension, ISO/IEC 14496-3:2001/Amd 1:2003". ISO. Retrieved 2009-10-13. ^ a b Scheirer, Eric D.; Ray, Lee (1998). "Algorithmic and Wavetable Synthesis in the MPEG-4 Multimedia Standard". Audio Engineering Society Convention 105, 1998. 2.2 Wavetable synthesis with SASBF: The SASBF wavetable-bank format had a somewhat complex history of development. The original specification was contributed by E-Mu Systems and was based on their "SoundFont" format . After integration of this component in the MPEG-4 reference software was complete, the MIDI Manufacturers Association (MMA) approached MPEG requesting that MPEG-4 SASBF be compatible with their "Downloaded Sounds" format . E-Mu agreed that this compatibility was desirable, and so a new format was negotiated and designed collaboratively by all parties. ^ ISO (2004). "Parametric coding for high-quality audio, ISO/IEC 14496-3:2001/Amd 2:2004". ISO. Retrieved 2009-10-13. ^ ISO/IEC JTC1/SC29/WG11 (2003-07-25). "Text of ISO/IEC 14496-3:2001/FPDAM2 (Parametric Audio) - N5713". Archived from the original (DOC) on 2014-05-12. Retrieved 2009-10-13. ^ 3GPP (2004-09-30). "3GPP TS 26.401 V6.0.0 (2004-09), General Audio Codec audio processing functions; Enhanced aacPlus General Audio CodecGeneral Description (Release 6)" (DOC). 3GPP. Retrieved 2009-10-13. ^ 3GPP (2005-01-04). "ETSI TS 126 401 V6.1.0 (2004-12) - Universal Mobile Telecommunications System (UMTS)General audio codec audio processing functions; Enhanced aacPlus general audio codecGeneral description (3GPP TS 26.401 version 6.1.0 Release 6)". 3GPP. Retrieved 2009-10-13. ^ a b ISO (2006). "Audio Lossless Coding (ALS), new audio profiles and BSAC extensions, ISO/IEC 14496-3:2005/Amd 2:2006". ISO. Retrieved 2009-10-13. ^ ISO (2007). "BSAC extensions and transport of MPEG Surround, ISO/IEC 14496-3:2005/Amd 5:2007". ISO. Retrieved 2009-10-13. ^ ISO/IEC JTC1/SC29/WG11 (July 2005). "Tutorial on MPEG Surround Audio Coding". archive.org. Archived from the original on 2008-03-24. Retrieved 2010-02-09. ^ a b c ISO (2005). "MPEG-1/2 audio in MPEG-4, ISO/IEC 14496-3:2001/Amd 3:2005". ISO. Retrieved 2009-10-13. ^ ISO (2005). "Lossless coding of oversampled audio, ISO/IEC 14496-3:2001/Amd 6:2005". ISO. Retrieved 2009-10-13. ^ ISO (2006). "Scalable Lossless Coding (SLS), ISO/IEC 14496-3:2005/Amd 3:2006". ISO. Retrieved 2009-10-13. ^ ISO (2008). "Enhanced low delay AAC, ISO/IEC 14496-3:2005/Amd 9:2008". ISO. Retrieved 2009-10-13. ^ ISO (2008). "ISO/IEC 14496-23:2008, Information technology -- Coding of audio-visual objects -- Part 23: Symbolic Music Representation". ISO. Retrieved 2009-10-13. ^ ISO (2008). "Symbolic Music Representation conformance, ISO/IEC 14496-4:2004/Amd 29:2008". ISO. Retrieved 2009-10-13. ^ ISO/IEC JTC 1/SC 29/WG 11 (April 2009). "89th WG11 meeting notice – Work plan and time line". Archived from the original on 2010-08-06. Retrieved 2009-10-13. ^ a b ISO (2009). "ISO/IEC 14496-3:2009/Amd 2:2010, ALS simple profile and transport of SAOC". ISO. Retrieved 2009-10-13. ^ a b ISO (2010). "ISO/IEC 23003-2:2010 - Information technology -- MPEG audio technologies -- Part 2: Spatial Audio Object Coding (SAOC)". ISO. Retrieved 2010-12-27. ^ "Unified Speech and Audio Coding". Archived from the original on 2011-07-16. Retrieved 2010-06-08. ^ "ISO/IEC 14496-3:2009/PDAM 3 - Transport of unified speech and audio coding (USAC)". 2011-06-30. Retrieved 2011-07-18. ^ "ISO/IEC DIS 23003-3 – Information technology -- MPEG audio technologies -- Part 3: Unified speech and audio coding". 2011-02-15. Retrieved 2011-07-18. ^ ISO (2009-09-11). "ISO/IEC 14496-3:2009/Amd 1:2009 - HD-AAC profile and MPEG Surround signaling". ISO. Retrieved 2009-10-15. ^ ISO (2009-10-08). "ISO/IEC 14496-3:2009/Amd 2:2010 - ALS simple profile and transport of SAOC". ISO. Retrieved 2009-10-15. ^ a b ISO (1997). "ISO/IEC 13818-7:1997, Information technology -- Generic coding of moving pictures and associated audio information -- Part 7: Advanced Audio Coding (AAC)". Retrieved 2009-10-19. ^ Business Wire (2009-01-05). "Via Licensing Announces MPEG-4 SLS Patent Pool License". Reuters. Archived from the original on 2013-01-04. Retrieved 2009-10-09. ^ Via Licensing Corporation (2009-05-12). "Via Licensing Announces the Availability of an MPEG-4 SLS Joint Patent Licensing Program". Business Wire. Retrieved 2009-10-09. RadioFeeds UK & Ireland – Page containing plenty of terrestrial stations webcasting in AAC+ format.